Wyoming is home to a variety of natural attractions, millions of drivers each year use the states roadways to visit destination spots such as: Yellowstone, Grand Teton National Park, and Devils Tower. This state has many highways, roads, and freeways making it perfect for back country cruising and day-to-day commuting for residents. 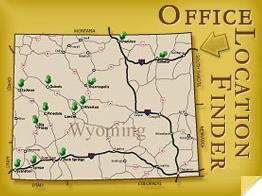 Tegeler and Associates is the premier insurance provider in Wyoming and serves all areas including: Pinedale, Jackson, Sheridan and Gillette. For more information on auto insurance or for a quote contact Tegeler and Associates today at 307-367-2154. At Tegeler and Associates, we strive to provide the best coverage and lasting relationships to all of our clients. We will work with you one-on-one to do a policy review, or a new quote to make sure you have the best coverage within your budget. For more information on car insurance in Pinedale, Jackson, Sheridan and Gillette or anywhere in Wyoming, contact Tegeler and Associates today at 307-367-2154 or click here for a free quote. Get an auto insurance quote today!